The aquaculture of red drum in the US occurs only in the state of Texas, with 7 active farms. All of the US production is in Texas, which provides around 2% of the global total. No commercial fishery exists for the red drum as the population was depleted in the 1970’s. This led to the farming of the species as a way to supplement the wild stocks. Aquaculture currently supports the recreational fishing of red drum. The red drum is a marine fish which is highly adaptable to varying environmental conditions. This makes it an ideal candidate for aquaculture. 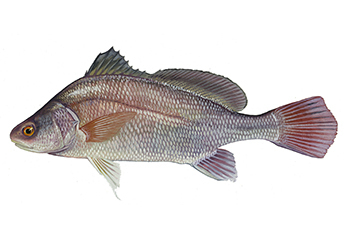 The aquaculture of red drum relieves pressure on wild stocks to satisfy consumer demand for sport fishing. The feed used in red drum aquaculture is composed mainly of the Gulf Menhaden, which is not a species at risk. Predator mortality is rare, and is minimized through good farming practices. Risk of escape and spread of disease is extremely low, since the fish are reared in enclosed ponds that are not directly connected to natural water bodies. There is minimal stress imposed on wild stocks, as 75% of the fish are sourced from domesticated broodstock. There are minimal habitat and ecosystem impacts since the farm is not located on particularly sensitive habitat, and chemicals are rarely used except in cases of severe algal blooms. The farms are largely sited on former wetland and estuary environments that have previously been altered for agriculture and ranching use and so are considered a secondary habitat conversion of the historic wetlands. Water must be treated before being released, which occurs rarely. The Gulf of Mexico black drum commercial fishery was worth USD 6 million in 2015, with most of the market based in the US, although some are sold to Mexico. Louisiana is the primary producer (67%, 1,874 mt in 2015), followed by Texas (30%, 852 mt). Abundance and mortality are considered a low concern in Louisiana, though bycatch of a variety of finfish species and potential interactions with turtles are a concern. Management has a number of effective measures to manage stock impacts including quotas and automatic closure if stock indicators fall below limits. Trotlines have a low impact on the habitat. The Gulf of Mexico black drum commercial fishery was worth USD 6 million in 2015, with most of the market in the US although some are sold to Mexico. Louisiana is the primary producer (67%, 1,874 mt in 2015), followed by Texas (30%, 852 mt). Abundance and mortality are considered a low concern in Louisiana, though bycatch of a variety of finfish species and potential interactions with turtles are a concern. Management has implemented a limited entry and license buyback program, but there are no possession limits for fishers. Trotlines have a low impact on the habitat.